Following the 2016 Referendum, Poles in Britain have hardly been out of the news. “There’s too many of them here!” was the popular cry, the very same cry, ironically, that was heard when Spain joined the EU and their nationals started arriving to work and study here. Michał is an architect from Poland and Seila is a Spanish graphic designer. They are a typical, metropolitan, professional couple, raising their little boy in the city they love, yet they see events from both a British and a European perspective. Michał observes: “When I was 27, I came to London for work experience and I’ve never left. I thought London was extraordinary in every way: the sheer scale of it, the number of things to see, the variety of people living here from all over the world. Following the Referendum, several Poles were killed, simply for being Polish and, with the popular press continually lamenting the ‘Polish invasion of Britain’, the increase in xenophobia was surely no surprise.” Michał and Seila fear that if Britain ‘raises the draw-bridge’ and foments hostility towards its EU neighbours, London will forfeit its position as ‘the capital of Europe’ (as Michał sees it) and its immigrant population will be reduced to second-class citizens. 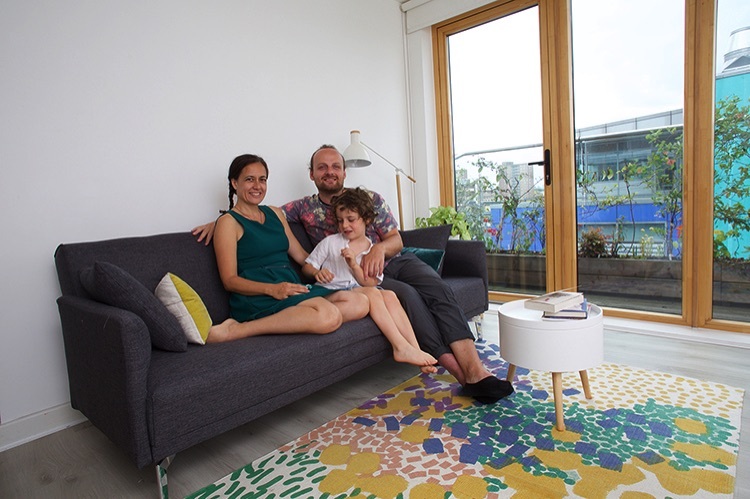 I arrived one Sunday morning to the stylish north-east London flat of the architect, Michał Ogłaza, his wife Seila Sarramian, and their six year-old son, Victor. Their contemporary dwelling is almost minimalist in character: every piece of furniture, indeed every item within this domestic setting, reflects the aesthetic tastes of these two creative individuals. Both parents have pronounced accents, Polish and Spanish respectively, but their little boy greets me in perfectly enunciated English, while simultaneously continuing a conversation with his parents, in fluent Spanish to his mother and in equally fluent Polish to his father - what a remarkable facility with languages at such a tender age! I have been invited to photograph the family in their home and to learn about how they first came to live in London, how well they have been able to integrate here, and how they feel about Brexit at this stage. Katowice is a small, Silesian town: historically, it had been largely inhabited by Poles but, once its rich coal deposits began to be exploited in the 18th century, followed by an industrialisation that saw the establishment of steelworks, foundries and various associated workshops, the area experienced a major influx of settlers, including Jewish, German, Czech and Slovak artisans. It became something of a melting pot of central European traditions and cultures and, thanks to its geographical position, the town experienced a succession of political masters too. While all of them left behind their particular legacies, above all they helped to created a unique mentality amongst the population who certainly had an outlook on the world that was different from most other Poles. Michał’s own family very much embodied the special spirit of Katowice, the spirit, one might say, of a thoroughly European place. “Having started at the neighbourhood primary school, I progressed to the local college, and generally, I met with success. I always drew well and because I was also what is called ‘creative’, I progressed to study architecture in Gliwice which is well-regarded in this field throughout Poland. I didn’t quite finish my studies, however, having decided to come to England to do seasonal work during a university break. While I longed to come to London, that was definitely my preference, circumstances brought me to Leicester instead, though I must admit, I found Leicester surprisingly cosmopolitan: the city had well-established Indian, Somali and even Polish communities. Having arrived from provincial Poland, I very soon felt that this was a place where I would like to stay. This must seem very subjective, I know, but I genuinely felt that the whole society was welcoming and accommodating to new arrivals. Within two weeks of being in Leicester, I started to feel liberated. Of course, I could see that there were differences between the city’s multifarious inhabitants but at that stage, I did not perceive any major tensions. I had a strong feeling that here, I could be just the person I was, I could do whatever I wanted to do, and that, within reason, no-one would put obstacles in my way. I accept that this was perhaps a little naive, but that is exactly how I felt at the time. In Poland, coming from a very middle class family, I always felt constrained to conform to the mores and morality of my class, to observe its conventions. Finding myself in Leicester, I felt that I had arrived to a much more open society. After just over a year in Leicester, I finally made it to London. Here, while working in an architectural practice, I enrolled at the London Metropolitan University, completed my studies, graduated, and finally became the fully-qualified architect I had wanted to be. I now work in a medium-sized architectural practice where I am associated with a number of quite prestigious projects here in the capital. London has become my home and I now share it with my wife, Seila, and our little boy, Victor. Life has generally been kind to us. “Once the result of the referendum became clear, we were fearful of becoming second-class citizens in the country we lived in. Like many of our European friends, we were both forced to consider whether this was somewhere we could continue to live; almost overnight, we felt unwanted. I have recently acquired British Citizenship, whilst maintaining Polish citizenship too. Of course, we felt that we always had the option to go and live somewhere else, we kept the doors open, but by now, we feel that the UK is where our home is, this is where our son is growing up, this is where my professional links are, and where our property is. Sadly, things have certainly changed fundamentally: I no longer feel that East Europeans are welcome and safe in England, and if Brexit does finally, actually happen, then I shall surely be grieving over London the way it might have been, the ‘Capital of Europe’. La Rioja is located in the north of the Iberian Peninsula and is possibly best known internationally for its fine wines. The Romans occupied the territory, as did the Moors after them, and then, in the early tenth century, the region became part of the Christian Kingdom of Pamplona. In 1980, the province changed its name from Logroño to La Rioja and became an autonomous community - the second smallest in Spain, by area, with the smallest population too. The region has a rich tradition of crafts, together with some industry, but it is the local wines that have gained Rioja worldwide renown, and Seila’s family property makes a modest contribution to it. Seila has now applied for British Citizenship herself, so I asked her if she would have done this if Brexit had simply never happened: “ No, never; there would have been no need for it. I consider myself Spanish, of course, but I also think of myself as a European and I consider Britain to be part of Europe too, except not quite, as it now appears. I realise that my having British Citizenship will not resolve our predicament entirely and I well understand that I will always be seen as a Spaniard first; but I also believe that London will carry on being London, comprising people from all over the globe. Without its multicultural community, London would be nothing. Of course, I expect to continue to be an outsider but I have a firm intention to remain a positive and productive citizen while, at the same time, being proud of my heritage. I intend to make sure that our son has a good understanding of where his family’s roots are, while he flourishes in and enriches the country where we have chosen to settle, and this city that we dearly love. I will become a British Citizen because I refuse to be made a second-class citizen.” Seila concludes with a firm voice, belied by her friendly smile. Britain joined the European Union on 1st January 1973, whereas Spain and Portugal were part of the third enlargement, of 1986. While seasonal workers from Iberia had come to England for many years, quite a few of their fellow countrymen now travelled to England, Ireland, Germany, France and Holland in search of more permanent work. One remembers the British popular press, full of alarming stories about Spaniards swamping our country, with the result that many new Spanish and Portuguese arrivals received a less than welcoming reception. Most of them became productively employed and have now become a relatively small but quite important minority within the capital. At least partly prompted by Spain’s economic crisis, of 2010-15, migration from Spain to the UK increased by 107%, but this was not an entirely one-way traffic: Brits have for many years favoured Spain as a holiday destination and every year, many millions have headed off for some Spanish sunshine. Since Britain joined the EU, many British people have also found work in Spain or have decided to retire there. While the precise figures are disputed, there are probably around 380,000 Brits permanently resident in Spain or living there for extended periods. Thus, while there is almost a symbiotic relationship between two countries, the British popular press likes to paint a very different picture. The Brits are traditionally represented as givers (they purchase property, they support the local economy, and they bring money to spend in Spain) whereas the Spaniards are often portrayed as takers (they take British jobs, they take up social housing, and they exploit local services, like schools and the NHS); rarely are they seen as the net contributors to the British economy that they are. The endless rehearsal of such systematic distortions and the simplistic and tendentious presentations of the facts have poisoned many British minds and done a considerable disservice to us all. Poland joined the EU in May 2004 and by 2005, the number of UK residents who’d been born in Poland was as high as 831,000, and that number continued to grow further until quite recently. However, this figure includes approximately 200,000 Poles who settled in Britain after the Second World War. Polish has now become the second most widely-spoken language in Britain - about 1% of the UK population speaks Polish. Of course, like the British, the Poles were a trading nation and in the 16th century, when most of the grain arriving from Poland came via Gdańsk, Polish diplomats, merchants and travellers came too, and so did the artisans. The Poles are even mentioned in Shakespeare’s Hamlet (as "sledded polack”) and in the 18th century, Polish protestants settled in Soho, colonising a street which subsequently became known as ‘Poland Street’. After the Germans and the Soviets occupied Poland in 1940, the exiled Polish President and Prime Minister, the whole government, together with over 20,000 soldiers and airmen relocated to England. Poles became the forth-largest Allied armed force and they were the largest group of non-British personnel in the RAF during the Battle of Britain. The post-war settlement aggrieved many Poles greatly; they felt betrayed by the Allies who seemed to have abandoned them to become a Soviet satellite state - it was a hollow victory to have helped liberate Europe from the Nazis, only to become one of Stalin’s Warsaw Pact territories. Unsurprisingly, many more Poles fled and those who had been living in the UK during the War, either settled or emigrated to Canada and Australia. The Poles who chose to settle in London still talk about how unwelcome they were made to feel by some locals, despite the fact that they had so actively fought Fascism on the same side as the British - London’s Polish cemeteries bear witness to the hundreds of servicemen and pilots who lost their lives in the defence of our liberty. But Poles are resilient people: they gradually integrated into London life, many were both talented and highly educated, and they made a noteworthy contribution to the economy, culture and arts of this city. While maintaining the best of Polish traditions, many became respected London citizens, who promoted the best in British values. The Polish Government in London (ie opposed to communism) was not actually dissolved until 1991, and then only after a freely-elected president was once again installed in Warsaw. When Poland joined the EU, that country had a great surplus of highly-skilled, well-qualified and talented young people, people who wished to travel to other countries in search of better jobs and a better life. By 2013, over half a million new arrivals from Poland were working in Britain and often the most qualified and ambitious among them headed to London. Although this figure would increase further, as Poland’s economy thrived and its prosperity grew, many Poles decided to return home and to open businesses in their native land. The ill-fated Referendum on British EU membership has amplified this trend, bringing about a significant exodus (a ‘Brexodus’) of those those who no longer feel welcome in the UK, or who simply fear that Britain’s exit from the EU will damage this country greatly, affecting their lives just as negatively as everyone else’s. The British popular press reacted to this perceived Polish invasion of Britain in just the same way it did to the arrivals from Spain and Portugal decades before. Poles were caricatured as a race made up almost entirely of plumbers and builders and, while a goodly number of highly-skilled construction workers became a vital component of many London building sites, highly-qualified and exceptionally industrious young Polish men and women have become evident in all walks of life - in the NHS, in Social Services, in the hospitality industry, and in London Transport. Like our Michał, some of them are architects, others are designers, engineers, and prominent contributors to the capital’s culture, to Education and the Arts. Of course, as might have been easily predicted, following the June 2016 Referendum, Poles were subjected to xenophobic attacks - several have been killed - and they continue to be vilified, sometimes even by members of other ethnic minority groups. I was recently told by a black youngster from Nottingham that there were simply too many Poles in his city. I was frankly astonished, wondering how he could have somehow failed to notice just how much of exactly the same sort of mindless hostility and discrimination continues to be directed towards many black communities in Britain. London surely is a wonderfully successful, international melting pot, a city that has drawn enthusiastically, perhaps greedily, upon the creativity, the skills and the energy of those peoples it has attracted from all over the globe, in order to fashion itself into the wealthy, productive and vibrant capital we see today. Poles and Spaniards have, of course, made their invaluable contribution to this exciting, heady mix. Only post-Brexit, when the ‘Brexodus’ of talented Europeans grows from a trickle into the inevitable flood, will the sons and daughters of Albion come to realise how, blinded by a noxious xenophobia and paralysed by the fear of anything unknown, they have exchanged a vigorous heterogeneity for such an attenuated, moribund purity that we shall all be left gasping for air, like the over-bred bulldogs we prize so much.